Guillaume and Angela are awaiting some new furniture, and some refurbished lamps. So first, Angela's mother gave them 3 lamps (and almost a 4th, but we're still waiting for that one...). They took them to a beautiful lighting shop, and got some new lamp shades. 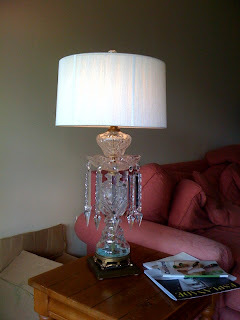 Two of the lamps need to be fixed a little bit, but they did get to take this beautiful crystal lamp home with a new shade. This lamp used to be Angela's grandmother's lamp a long long time ago. The lamp is very traditional, and the shade is a little contemporary. The sofa is taking a long time to arrive. Guillaume ordered it a week before Cyril arrived here. It should be here within the next week or so. 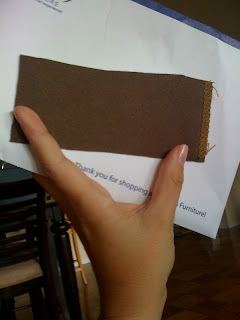 This is the sofa - but the color will be this little swatch, not the grey in the picture. 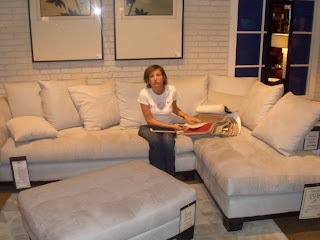 This is Angela on the sofa in the furniture shop. They did not buy the ottoman in front. This is Guillaume's new desk. This will arrive at the end of October! This will go where his current desk sits now, at the front of the apartment, next to the wall of windows. And finally, this will be placed along the wall that the livingroom shares with the bedroom, right at the hallway entrance to the bed and bathrooms. The crystal lamp will eventually be on this table as well. Of course, this will not arrive until the end of October either. 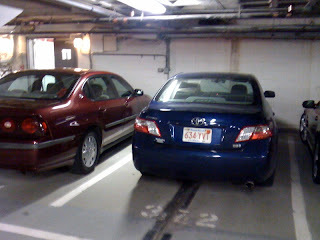 And finally, this is the parking space. Hooray! It's inside, and warm, and it won't get snowed on, or rained on, and it will be very nice when it's a terrible day outside to just take the elevator to the basement and get into the car. And the parking space is just 2 spaces away from the door! How lucky! See below for some bathroom pictures, too. We miss you all, and can't wait to see you soon. coucou les petits. De retour de la campagne, avec Mamy Dédette, on a repassé TOUTES vos photos archivées depuis 1 an et, surtout, celles de votre nouvel appartement Merci à ANGELA pour tous les détails et ses remarques amusantes. (J'ai trouvé le moyen de traduire en temps réel). Donc, ANGELA peut continuer à bloguer. On se régale de ses commentaires et des images. Gros bisous de Py et My. PS : Qui est Sal ? Welcome !!!!! !All is very nice and I am sur your old lamps 'll be perfect with all others furnitures! nice funiture, cabinet looks gorgeous! way to unpack the play station first!!! what's happening to the old couch?? Donc ça marche ! Youpi ! La family est en pétard. Hier étions à l'élection régionale de Miss Orléanais à MONTARGIS. De très très loin, Chanel devait gagner. Le jury était quasi unanime. Et puis, magouille et c°, on refait le vote pour faire passer une nana locale. Consol' Chanel est élue 1ère dauphine. Scandaaaaaaaaaleux ! Chanel en pleurs comme tout le monde. Envoyez lui un petit mail pour lui remonter le moral....et le nôtre. c super cette nouvelle adresse j arrive enfin a vous envoyer des messages cool super deco !! I love your stuff Ang ! That looks great! Spacify offers wide range of furniture for decorating your home. 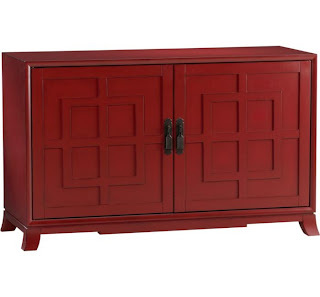 Find huge collection of Apartment furniture from casamodern.